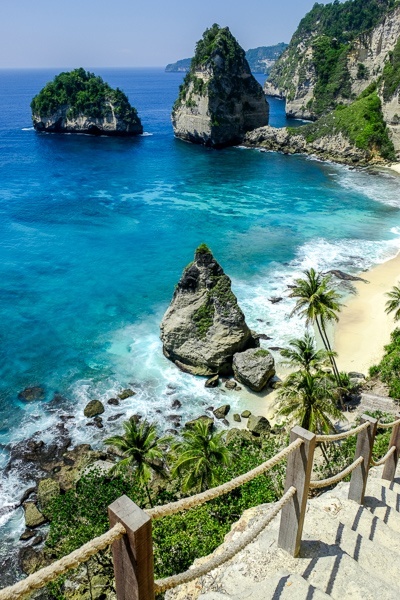 Diamond Beach, named after the pointy diamond shaped rock on the beach, is another utterly incredible ‘cliff beach’ on the south coast of Nusa Penida. It looks similar to Suwehan Beach, but even better in my opinion. Diamond beach is newly accessible for the first time since late 2018, when a path down to the bottom was carved into the side of the cliffs here. The path (and safety railings) are still under construction, but you can reach the bottom alright if you walk carefully. At the bottom there is a big stretch of perfect white sand, and the water is such a bright turquoise color it almost looks like Listerine or something. But the huge diamond shaped rocks are what really sets this beach apart and makes it one of the most incredible beaches in the world, in my opinion. There are some clefts in the rock wall where you can hide from the sun if it gets too hot; the white sand can be blindingly bright on a sunny day, so it’s good to have some shadowed spots where you can escape the heat. 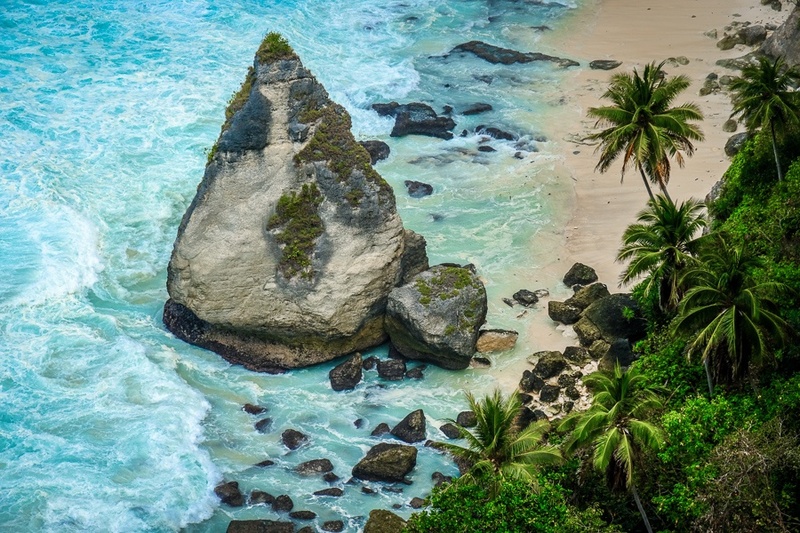 I haven’t climbed the green slope on the far end of the beach yet, but it’s on my list; there’s another small hidden beach on the opposite side of the slope, but it’s not visible from most viewpoints. This whole beach area is definitely bigger than it looks in photos, so there’s lots of exploring you can do here. I’ve even seen some wildlife occasionally, from monitor lizards to dolphins and manta rays. Diamond beach as seen from above with a drone. 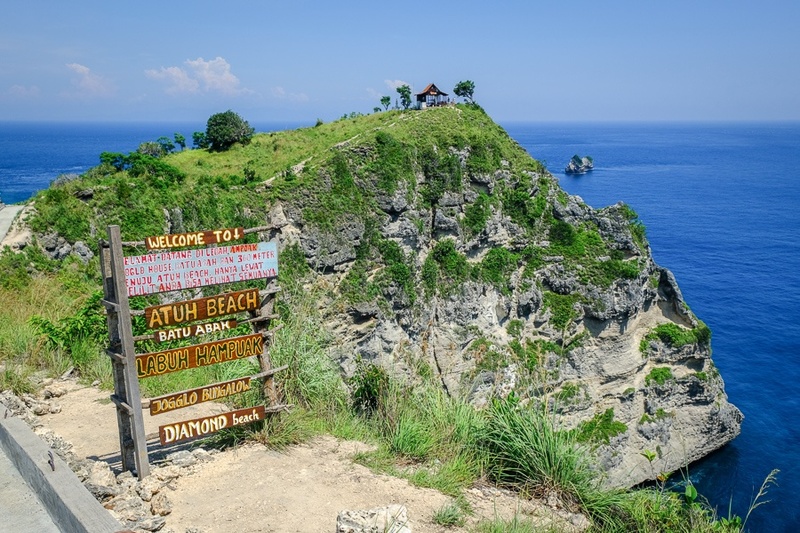 Diamond Beach is on the southeast side of Nusa Penida island. 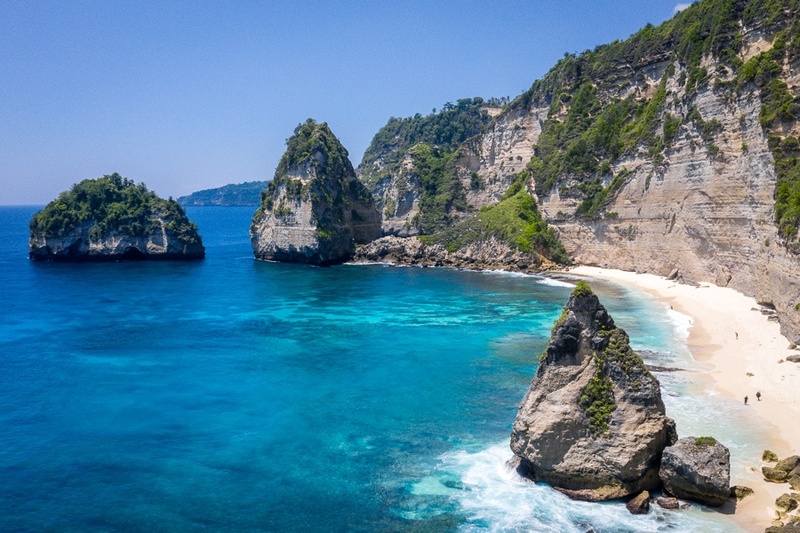 It’s accessible by car or scooter, about 1 hour drive from the main docks and accommodation in northern Penida. Be careful if you go by scooter because the road is rough and may be dangerous in some spots if you don’t take it slow! The parking fee is 10,000 IDR (70 cents) as of 2019. From the parking lot, it’s a short but steep hike down to Diamond Beach. The parking location in the map below allows you to visit two incredible locations within a short 15 minute walk of each other: Atuh Beach and Diamond Beach.